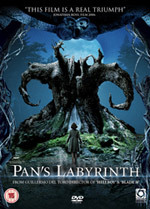 With box office figures still growing and fast-approaching £2.5 million - almost unheard of for a foreign fantasy horror film - Pan's Labyrinth finally hits the shiny disc format when Optimum release the 2-disc DVD on the 12th March. 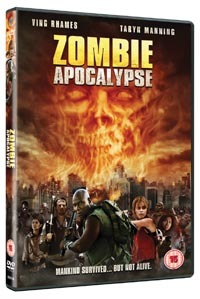 Easily voted our favourite film of 2006 by most of us here at EMB (see our Top Ten Films of 2006 for the full list), this DVD is an absolute must, especially as it's a Two-Disc Edition, complete with a director's commentary, and a whole heap of other extras that run for over two hours. The first truly essential purchase of 2007! Set during the end of the Spanish Civil War, Pan’s Labyrinth tells the story of Ofelia (Ivana Baquero) whose mother has recently remarried. They both move to the country and into the house of the new husband, coldly authoritarian Vidal (Sergi Lopez), a captain in Franco’s army. Finding her new life hard to bear, the young girl seeks refuge in a mysterious labyrinth she discovers next to the sprawling family house. Pan, the guardian, a magical creature, reveals that she is none other than the long lost princess of a magical kingdom. To discover the truth, Ofelia will have to accomplish three dangerous tasks, as well as risking incurring the wrath of her dangerously volatile stepfather.